High Point Spring Market has just wrapped up. These Markets pave the way for new ideas and innovations in the furniture retail realm. Trends are displayed on showroom floors, best business practices are discussed and retailers return to their own locations with brand new insights. One recurring theme throughout Market was the topic of company culture and how it plays a role in success. Marilyn with STORIS COO, Doug Culmone. STORIS attended many events during our 6 days at Market. We kicked off our trip with the WOW Awards ceremony hosted by WithIt, an organization that recognizes women in our industry. 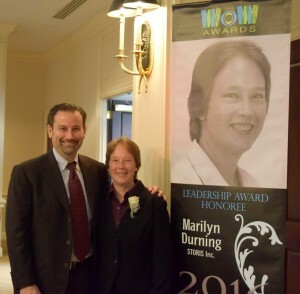 Our own Vice President of Client Services, Marilyn Durning, was honored as a Leadership nominee. Marilyn has been with our company for over 20 years and is responsible for not only overseeing Client success, but plays a large role in the internal health of our organization. She is a true leader and deserves the honor and recognition. Some of our STORIS employees attended the HFA NextGen Event, Lunch with Leaders. The event was hosted by Eric Easter of Kittles Furniture and focused on the importance of company culture. He stressed on the significance of equality in the workplace and showing employees the value of their role within the company. Many of the points touched on during the lunch coincide with STORIS’ Core Values. A study by StackHands reveals that companies with engaged employees outperform those without by up to 202%, but that 64% of all employees do not feel they have a strong work culture. At STORIS, we believe in fostering a positive work environment by recognizing each other’s achievements and planning events that encourage co-worker interaction. Our employee tenure of over 9 years is made possible because of the belief system we have in place. As a guest of the NextGen event, it was interesting to hear how other companies achieve success in providing a positive environment for their employees. Aside from the style and trends that were abundant, there was a lot to be learned about business success at High Point Market. The WOW Awards proved that women hold a significance in many aspects of the furniture industry. It is obvious that the health of a company starts from the inside, and this notion was echoed throughout the Lunch with Leaders event. Company culture is an important factor to consider when operating any type of business and should be considered a priority.